A respected, veteran Usenet service that offers plenty of retention and doesn’t compromise on price. 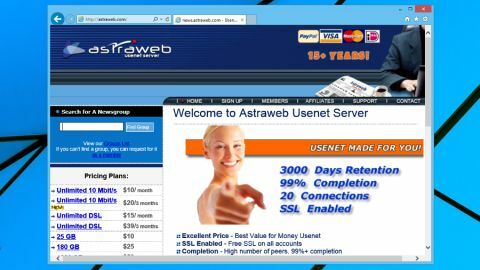 If you’re looking for a good, all-round Usenet service, there’s no denying the might of Astraweb. It’s one of the most popular options out there, offering ample retention (the length of time content is kept), block accounts, multiple payment options, SSL and more. Owned and operated by Singapore-based tech firm Searchtech, the software has been on the Usenet scene since 1998. It’s an industry veteran, and a service to consider if you want something with real credibility. This capable Usenet service follows a subscription format with prices starting at $10 (£7.70, AU$13) per month. Once you sign up to the service, you’re provided with access to news servers based in the US and the Netherlands. These are set up as different entities, so you’ll find that they have different files available. Essentially, you’re getting access to two distinct services for the price of one. Aside from a subscription, it’s also possible to purchase a block of Usenet access instead. Whichever route you wish to take in terms of payment, you can connect to either server, and easily change if you think you’d prefer the other. Both servers offer 20 simultaneous connections if you go for an unlimited account, and there are 50 available for blocks. There’s also free SSL for all account holders, along with alternate ports if you run into bandwidth issues due to the ISP you use. When it comes to binary retention, Astraweb certainly doesn’t disappoint and works out to be one of the best on the market. It offers 3,000 days retention, which is among the highest we’ve seen. As well as this, there’s a high number of peers and 99% availability. As for anonymity, no logs are kept by the company, and you benefit from anonymous group requests and anonymous posting – so you can protect your identity online. Discussions within the Usenet are uncensored, and we’ve found that there’s generally good propagation of posts with other users. Another positive thing about Astraweb is that it owns all its servers and doesn’t resell them, so you needn’t worry about your information being put at risk. And you shouldn’t experience rocky download rates (unless your connection is at fault, of course). Recurring plans are billed on a monthly basis, while you buy the block option outright – there are 25GB, 180GB and 1000GB offerings available. Subscription plans don’t cap your speed, though with the block plans, you can only go up to 10Mbps. Naturally, it all comes down to what you want to pay, but the unlimited plans aren’t as expensive as other Usenet services out there. If you purchase an account, you get access to an online help centre where you can post questions and speak to specialists about the platform. However, many users have complained about the quality of support offered by Astraweb, and some believe that it has declined significantly over the years. Should this be a concern, you could always purchase a block to explore the service before making a final decision. Astraweb is a veteran and trusted Usenet operator which is both affordable and flexible. Plus you’re effectively getting two distinct services for the price of one here, which is definitely an added bonus.